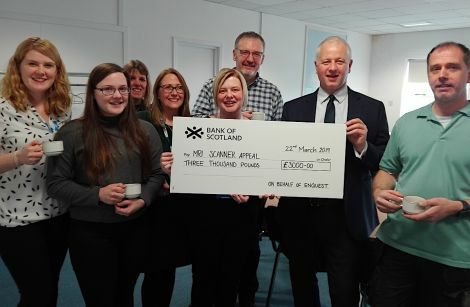 NHS Shetland staff enjoying a cup of tea with EnQuest asset manager Ian Lister when he delivered a cheque for the MRI Scanner appeal. From left to right: Kari Wright, Jenna Laurenson, Laura Pottinger, Lorraine Allinson, Lisa Gray, Gary Robinson (NHS Shetland chair), Ian Lister (EnQuest) and Billy Middleton. The NHS Shetland Scanner Appeal was nominated by terminal workers to receive the money which was raised through staff donations in buying old office furniture and from its ‘Green Day’ initiative. The MRI scanner appeal has now raised over £125,000 – six per cent of the £2 million total. NHS Shetland chairman Gary Robinson added: “This equipment – which will be the very latest technology – will benefit all in Shetland – including staff at big employers like EnQuest. POLICE are looking to speak to anyone who may have witnessed vehicles being vandalised in Lerwick at the weekend. Damage was caused to the driver’s side window of a Vauxhall Vivaro van and to the wing mirror of a silver VW Golf at Staney Hill in the early hours of Sunday. Any witnesses are asked to contact the police on 101. SCALLOWAY school and pre-school will be open again on Tuesday after a slightly extended Easter break. The school had to stay closed on Monday due to a leaking water tank. Shetland Islands Council confirmed on Monday afternoon that pupils will return on Tuesday.